Why A Low Angle Break? Home Titanic Research Articles Why A Low Angle Break? In the James Cameron film "Titanic," we all saw the stern of the ship rise up in the air and take on a relatively steep angle as the bow of the ship sank deeper and deeper into the water. Suddenly, the hull split and the stern came crashing back only to sink in the next few minutes. Yet, when we look at the historical record from those who were there and actually witnessed the break, we get a very different impression. "Her foremost lights had disappeared [under the water], and her starboard sidelight left burning was the only light, barring the masthead light, on that side of the bridge that I could see...You could not see her keel...You could just see the propellers...A little while after that we pulled a little way and lay on the oars again. The other boats were around us by that time, and some were pulling further away from us. I stood and watched it till I heard two sharp explosions in the ship. What they were I could not say. Then she suddenly took a top cant, her stern came well out of the water then...She took a heavy cant and her bow went down clear...Head down, and that is the time when I saw her lights go out, all her lights. The next thing I saw was her poop. As she went down like that so her poop righted itself and I thought to myself, ‘The poop is going to float.’ It could not have been more than two or three minutes after that that her poop went up as straight as anything; there was a sound like steady thunder as you hear on an ordinary night at a distance, and soon she disappeared from view." "Her head was going well down...her stern was well out of the water...It righted itself without the bow; in my estimation she must have broken in half...I should think myself it was abaft the after expansion plate...I should say it would be about abeam of the after funnel, or a little forward...I saw the poop right itself...then it went up and disappeared from view." Just before the breakup the bow of the ship forward of the bridge was under water while the stern was high enough so that the ship's propellers were visible to those in the boats. Suddenly two sharp cracks that sounded like explosions to some were heard, and the ship dipped further down by the bow as the stern started to come further up. Then all the lights on the ship went out as the stern settled back to a point were it almost righted itself. The part of the ship ahead of the vicinity of the aft expansion joint was now completely gone. To Symons, and a few others in the boats, it looked like the remaining stern of the ship was going to stay afloat. However, within two or three minutes, the forward end of the remaining stern dipped downward as its after end came almost straight up in the air. Then, with a steady rumbling sound that was heard across the water, the stern came down and sank below the surface. The water was over the base of the first funnel. The mass of people on board were surging back, always back towards the floating stern. Suddenly the whole superstructure of the ship appeared to split, well forward to midship, and bow or buckle upwards. The second funnel, large enough for two automobiles to pass through abreast, seemed to be lifted off, emitting a cloud of sparks. It looked as if it would fall on top of me. It missed me by twenty or thirty feet. The suction of it drew me down and down, struggling and swimming, practically spent. As I finally came to the surface I put my hand over my head, in order to push away any obstruction. My hand came against something smooth and firm with rounded shape. I looked up, and realized that it was the cork fender of one of the collapsible lifeboats, which was floating in the water bottom side up. About four or five men were clinging to her bottom. I pulled myself up as far as I could, almost exhausted, but could not get my legs up. I asked them to give me a hand up, which they readily did. Sitting on my haunches and holding on for dear life, I was again facing the Titanic. Thayer had witnesses the ship split in two shortly after jumping into the water. The “gigantic mass” that he described seeing after he was pulled aboard overturned collapsible B was the remaining stern section which had settled back after the split. And like Symons, he described the stern as slowly rising high into the air before it slipped down into the sea. The rising of the stern high out of the water shortly before she slipped into the sea has led some people to believe that the ship had assumed a high angle before the break took place. However, this is not supported by the visual evidence of those like lookout Symons who were in a good position to witness much of what really happened, and more importantly, it is not supported by the forensic evidence of what is seen on the bottom. The steel was telling that the hull girder fractured at a low angle and subsequently settled and separated in a much less spectacular event than what was depicted in the Cameron movie. Following the 2005 expedition to the wreck, naval architect Roger Long believed that a hull fracture between 11 and 15 degrees was much more probable than a high angle break. A low angle break can be explained in a way consistent with the wreckage and the historical record, whereas the high angle break can not. Results from a subsequent study commissioned by the Lone Wolf Documentary Group by the maritime engineering firm of JMS has proved that Roger Long was right about the low angle break. It also showed that the stresses on the hull at the point when the break occurred were much higher than the stresses that the ship would ever have encountered under the worst service conditions of the North Atlantic, and that the ship’s longitudinal stability would be lost at a much shallower angle than what was previously believed.4 Simply put, the ship was not weak. It did not sink because it broke; it broke because it was in the very last stages of sinking. Is there a way to easily explain why a relatively low angle break is much more likely than a high angle break? The answer is yes. Consider a beam that is floating on water as shown below. What we will do is rotate the beam around a pivot point to simulate a ship going down by the head. As the bow goes down the stern is pulled up. What we can do is calculate the total bending moment (which is force multiplied by distance) at the pivot point that is tending to snap the beam in half caused by stern being pulled up. 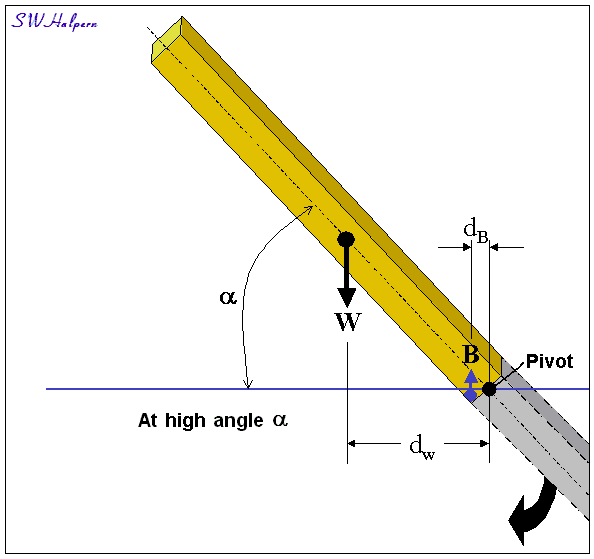 When the beam is horizontal and floating normally, the weight of the stern section of beam, W, acts at the point shown at a distance dW from the pivot. This creates a bending moment of W x dW on the pivot. However, because the beam is initially floating freely on the water, there is a buoyant force, B, acting on this section of beam at a point dB from the pivot creating a bending moment B x dB in the opposite direction trying to bend the beam upward. When floating on water the center of buoyancy of the stern section of beam is directly under the center of weight of the stern section, and dW = dB. 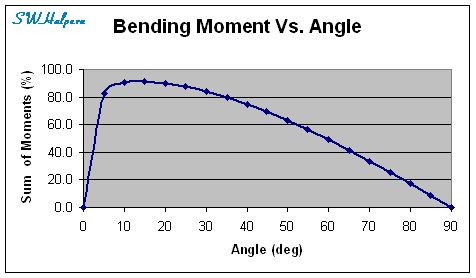 And because the beam is floating freely, the buoyancy force pushing upward, which is equal to the weight of the water displaced by the section of beam, equals the force of the weight of that section of beam pulling downward, thus B = -W. Therefore, the net sum of the moments produced when the beam is floating freely is zero. Now let's rotate the beam around the pivot so that the stern section of beam is pulled slightly out of the water to form an angle α as shown in the next diagram. Once again we can calculate the respective moments due to the weight and due to the remaining buoyancy. The center of buoyancy is shifted much closer to the pivot point reducing the length of the moment arm, dB, because there is less underwater volume at the aft end of the beam (on the left) compared to the forward end of the raised section near the pivot. The result is a serious reduction in the value of the buoyancy moment compared to the weight moment. It should be obvious that once most the stern section of beam is pulled out of the water what remains is only the bending moment due to its weight which is tending to snap the beam in two. Thus the overall bending moment sharply increases reaching a maximum when most of the stern section is pulled out of the water. Then, as the angle is further increased, that bending moment will start to be reduced as the moment arm for the center of weight, dW, moves closer toward the pivot point, reaching zero when it is directly overhead. You can easily experience this yourself by first trying to hold a baseball bat out at a horizontal angle, and then rotate the handle upward until the bat is held at a vertical angle. The greatest stress on your wrist is when the bat is horizontal and not supported by anything but the strength of your wrist. Notice how quickly the bending moment increases as the stern section of beam is first pulled out of the water. The peak is reached at a relatively low angle between 10 and 15 degrees. Then, as the angle increases, the bending moment starts to slowly decrease until it reaches zero at a vertical angle of 90 degrees. It should be obvious that if the beam was going to break at all, it would have to be at a relatively low angle near the point where the bending moment tends to reach its maximum. 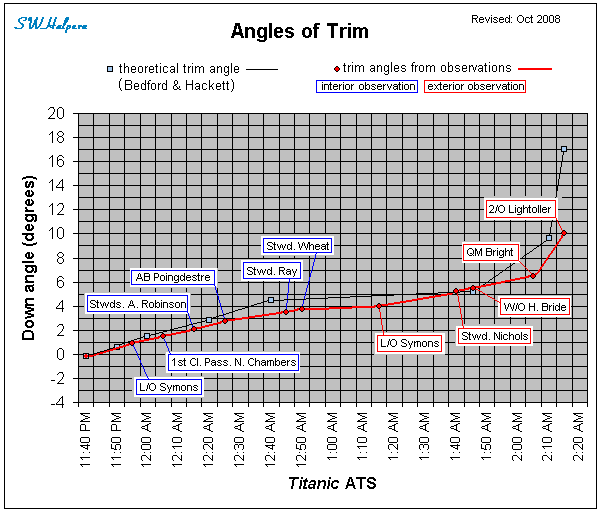 From this simple analogy of using a floating beam we can see why Titanic had to break at a relatively low angle, not at a high angle as depicted in the movies. Although much less dramatic, Titanic's break up on the surface was observed and described by several survivors as noted above. But even if the ship had not split in two, the ship was fast becoming longitudinally unstable just before the time that she broke. This can be verified by the rapid change in trim angle that was observed during her final moments before the break took place.5 The diagram below presents this data which was based on quantitative observational evidence. There have been suggestions of late that if Titanic had not broke apart it might have remained afloat for several more hours thereby enabling rescue vessels to reach the scene and save many of those who were lost.6 These allegations are based on supposition and hearsay, and are not supported by the facts as we know them. Less than 45 minutes after the ship struck an iceberg along her starboard side, Thomas Andrews, head of the design office of H&W, reported to Capt. Smith that it was his belief that the ship had only an hour to an hour and a half left to live.7 It was about this time that Smith gave the order to start loading the boats, which were in the process of being uncovered and swung out, with women and children. Because of the extensive flooding seen in the first 5 compartments, flooding that was later attributed to approximately 12 square feet of cumulative hull openings,8 the Titanic was a doomed ship. But what was really amazing is that Titanic actually lasted 2 hours and 40 minutes, which was longer than Thomas Andrews thought it would. This allowed 18 out of the 20 lifeboats carried to be launched from the davits while the ship remained relatively stable.9 Ironically, it was the inherent stability of the ship that may have led to a greater loss of life because it gave a false sense of security to many passengers during early stages of sinking. There are many reports of passengers reluctant to get into the early boats which were launched well below their rated capacities. It is also ironic that the breaking of the hull may have actually given some people clinging to the stern 2 or 3 minutes more to live before the stern went under. In one case it gave baker Charles Joughin enough time to cross the well deck and reach the outside starboard rail of the poop as the remaining stern section lurched over to port while its forward end started to slope downward as the poop came upward. And there it remained for a few extra life saving moments. 2 John Borland Thayer, “The Sinking of the SS Titanic,” 1940. 3 Lawrence Beesley, The Loss of the SS Titanic, Houghton Mifflin Co., 1912. 4 See Ship Structure Committee project SR-1451, Review and Update USCG SSC Website Case Studies, Titanic, http://www.shipstructure.org/project/1451/titanic.pdf. 5 Samuel Halpern, “Angles of Trim and Heel,” Titanic Historical Society's journal The Titanic Commutator, Vol. 30, No. 174. 8 Samuel Halpern, “Somewhere About 12 Square Feet,” TRMA website, http://titanic-model.com/articles/Somewhere_About_12_Square_Feet/Somewhere_About_12_Square_Feet.pdf. 9 Although the Andrea Doria had stayed afloat for 11 hours after her collision with Stockholm, half of her lifeboats were inoperative because of the severe list to starboard that developed within the first few minutes following the collision. In sharp contrast, Titanic never listed more than about 10 degrees while her lifeboats were being launched.